According to the traditional tuberculosis (TB) treatment paradigm, the initial doses of treatment rapidly kill most Mycobacterium tuberculosis (Mtb) bacilli in sputum, yet many more months of daily treatment are required to eliminate a small, residual subpopulation of drug-tolerant bacilli. This paradigm has recently been challenged following the discovery that up to 90% of Mtb bacilli in sputum are culturable only with growth-factor supplementation. These “differentially culturable” bacilli are hypothesized to be more drug-tolerant than routinely culturable bacilli. This hypothesis implies an alternative paradigm in which TB treatment does not rapidly reduce the total Mtb population but only the small, routinely culturable subpopulation. To evaluate these competing paradigms, we developed a culture-independent method for quantifying the viable fraction of Mtb bacilli in sputum during treatment. We used GeneXpert MTB/RIF to quantify Mtb DNA in sputa collected longitudinally from Ugandan adults taking standard 4-drug treatment for drug-susceptible pulmonary TB. We modeled GeneXpert cycle thresholds over time using nonlinear mixed-effects regression. We adjusted these models for clearance of DNA from killed-but-not-yet-degraded bacilli, assuming clearance half-lives ranging from 0 to 1.25 days. We used a convolution integral to quantify DNA from viable bacilli only, and converted cycle thresholds to Mtb genomic equivalents. We replicated our results in a South African cohort. We enrolled 41 TB patients in Uganda. Assuming a DNA-clearance half-life of 0 days, genomic equivalents of viable sputum bacilli decreased by 0.22 log/day until 8.8 days, then by 0.07 log/day afterwards. 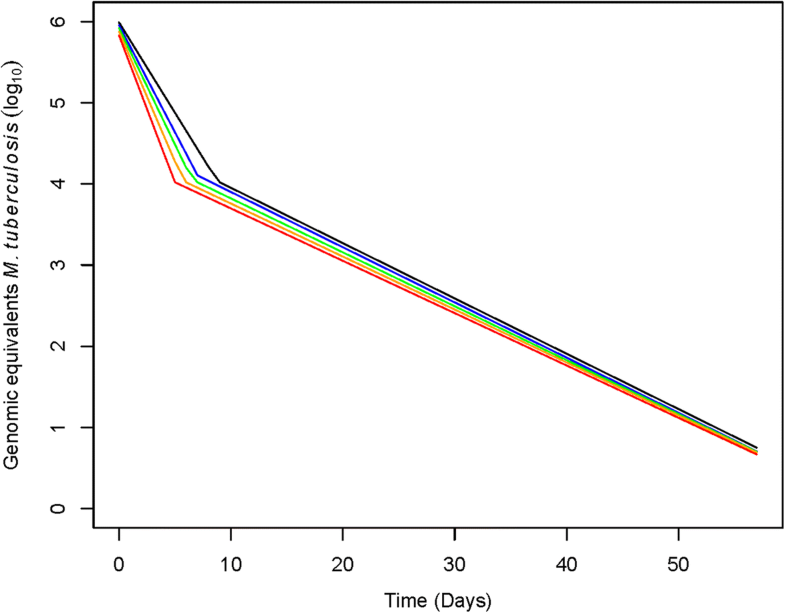 Assuming a DNA-clearance half-life of 1.25 days, genomic equivalents of viable bacilli decreased by 0.36 log/day until 5.0 days, then by 0.06 log/day afterwards. By day 7, viable Mtb had decreased by 97.2–98.8%. We found similar results for 19 TB patients in South Africa. Using a culture-independent method, we found that TB treatment rapidly eliminates most viable Mtb in sputum. These findings are incompatible with the hypothesis that differentially culturable bacilli are drug-tolerant. A culture-independent method for measuring viable Mtb in sputum during treatment corroborates the traditional TB treatment paradigm in which a rapid bactericidal phase precedes slow, elimination of a small, residual bacillary subpopulation. Traditional understanding of tuberculosis (TB) treatment has recently been challenged by reports that up to 90% of Mtb in the sputum of treatment-naïve patients may be non-culturable on standard agar plates, growing only with growth factor supplementation (“differentially culturable”) [1–5]. The traditional TB treatment paradigm is based on enumeration of Mycobacterium tuberculosis (Mtb) that grows on agar plates (routinely culturable Mtb). This traditional measure of sputum bacillary load suggests that killing is biphasic. The initial 5–7 day bactericidal phase appears to kill ~ 99% of Mtb in sputum [6–8]. During the subsequent, “sterilizing” phase of treatment, the rate of killing appears to slow by at least 80% . The residual population is comprised of drug-tolerant “persister” phenotypes that are capable of surviving prolonged antibiotic exposure despite an absence of drug-resistance mutations [10, 11]. Critically, the traditional biphasic killing paradigm hinges on the assumption that enumeration of routinely culturable Mtb accurately represents killing in the total Mtb population of sputum (i.e., it does not account for an additional, differentially culturable, component of sputum). The discovery of differentially culturable Mtb has raised concern that the traditional paradigm may be based on an incomplete and potentially misleading measure of Mtb burden. The differentially culturable Mtb population is particularly important if it responds to treatment differently than routinely culturable Mtb. Recent in vitro evidence suggests differentially culturable Mtb may be more drug tolerant than routinely culturable Mtb [3, 12]. This hypothesis implies an alternative paradigm in which drug-tolerant Mtb phenotypes dominate sputum even prior to TB treatment . This paradigm suggests that treatment does not rapidly decrease the total burden of Mtb in sputum; only the small routinely culturable fraction is rapidly and selectively eliminated . Validation of this alternative paradigm would fundamentally reshape our understanding of TB treatment and have critical implications for drug development . A key question is whether the hypothesized drug tolerance of differentially culturable Mtb has practical significance in patients with TB. Specifically, are differentially culturable Mtb phenotypes sufficiently drug tolerant in vivo that the traditional biphasic killing paradigm should be questioned? For the traditional paradigm to remain valid, routinely culturable and differentially culturable Mtb would have to be killed at roughly similar rates. By contrast, if differentially culturable Mtb are killed much more slowly, enumeration of only routinely culturable Mtb would misrepresent change in the total Mtb burden of sputum. This would favor the alternative paradigm that the total Mtb burden of sputum does not decrease rapidly. To re-evaluate these paradigms in a culture-independent manner, we developed a new approach to characterizing the rates and phases of Mtb killing during treatment for active TB based on Mtb DNA abundance in sputum. Quantification of Mtb DNA enumerates the total Mtb population (irrespective of whether bacilli are routinely culturable or differentially culturable). Using a conceptually simple mathematical model, we adjust our estimates of the quantity of Mtb for the characteristic of DNA that is often cited as limiting its usefulness as a measure of treatment response – its slow degradation after cell death . Our analysis does not address what proportion of Mtb in sputum is differentially culturable; instead we sought evidence that the differentially culturable Mtb population is cleared from sputum substantially more slowly than routinely culturable Mtb. The resulting culture-independent estimates of early killing support the traditional biphasic killing paradigm [6–8]. Our primary analysis enrolled consecutive adults hospitalized with drug-susceptible pulmonary TB at Mulago National Referral Hospital in Kampala, Uganda as previously described . Patients provided sputa and a NALC-NaOH processed pellet was treated with sample reagent and tested with GeneXpert MTB/RIF (Version G4, Cepheid, Sunnyvale, CA USA) testing before treatment (day 0) and after 2, 4, 7, 14, 28 and 56 daily standard doses of isoniazid, rifampicin, pyrazinamide, and ethambutol. To determine whether our results were reproducible, we selected a previously-published study in South Africa as a replication cohort. The South African study evaluated the effect of pre-treatment with propidium monoazide (PMA) on GeneXpert MTB/RIF (also Version G4) . Our analysis used only data from 19 patients with non-PMA treated (control) samples obtained at day 0 and after 3, 7, 14, 28, 35, and 56 days of treatment. Before treatment, the burden of Mtb DNA in sputum predominantly reflects the burden of viable bacilli. During treatment, measured DNA has two components: DNA from viable Mtb and residual DNA from dead Mtb. We aimed to estimate the viable and dead components. We defined the half-life of DNA clearance as days required for a 50% reduction in DNA from dead Mtb, due to either expectoration or degradation by active host processes. For any DNA burden at any time point, the longer the DNA clearance half-life is, the larger the dead component and the smaller the viable component must be. Using this construct and assuming a range of plausible clearance rates, we estimated the burden of viable Mtb over time. We modeled mean cycle-threshold (CT) values for GeneXpert during the first 56 days of treatment using a nonlinear mixed-effects model framework. Conceptually, mean cycle threshold is inversely proportional to the logarithm of the number of DNA copies. Therefore we modeled CT values as a linear function of the logarithm of the total DNA (viable + dead) at time t (See Additional file 1 for details). We assumed that the viable component of DNA in sputum decreased exponentially with treatment, and allowed the rate of decrease in DNA to change from a higher to a lower rate at a single time point; this change point was not pre-specified, but rather was estimated as a parameter in the model. We used a convolution integral to solve for the component of non-degraded DNA from dead bacteria at a given time t. We evaluated five possible DNA clearance half-lives: zero, 0.5, 0.75, 1, and 1.25 days. A clearance half-life of zero days represents the extreme and unrealistic assumption that DNA from dead Mtb is degraded instantaneously, implying that all Mtb DNA originates from viable bacilli. We used a likelihood-based approach assuming a Gaussian distribution to account for right censoring of Xpert CT values at 41 cycles. In addition, our models included a random intercept for each subject to account for correlation due to repeated measures made on subjects over time. Our base models assumed that, prior to treatment, 99% of Mtb DNA in sputum arose from living bacteria. In sensitivity analyses, we fit alternative models in which 80% or 90% of Mtb in treatment-naïve sputum was assumed to be viable. We fit all models in SAS 9.3 Proc NLMIXED. For the purposes of conceptual illustration only, we converted estimated CT values from our models to a measure of bacillary burden (“genomic equivalents”) based on the data previously presented by Blakemore et al. showing a linear relationship between log10 Mtb and Xpert CT values . For our primary analysis, 41 Ugandan adults with drug-susceptible, culture-positive pulmonary TB were enrolled. Twenty-three (56%) were persons living with HIV. The proportion with a positive sputum Xpert result declined gradually, from 100% at baseline to 80% at four weeks to 50% at eight weeks. The previously-published replication cohort included 19 South African patients with drug-susceptible TB and serial Xpert testing performed without PMA pre-treatment . With the half-life of DNA clearance assumed to be zero, the viable component of Mtb DNA in sputum initially decreased rapidly (− 0.22 log/day) among Ugandan patients. There was a change point at 8.8 days, after which the rate of decline slowed to − 0.07 log/day (Fig. 1 & Table 1). Even in this extreme case that assumed no dead component, viable Mtb decreased 97.2% from baseline to day 7. With more plausible estimates for the half-life of Mtb DNA clearance, the initial rate of killing was faster and the change point occurred earlier. For example, with a DNA clearance half-life of 1.25 days, the initial rate of killing was − 0.36 log/day) and the change point was 5.0 days. When the half-life was extended to 1.5 days, the model estimated no viable component at 7 days, inconsistent with the positive culture results obtained from each individual. The rate of killing was 69.4–82.2% slower in the later killing period relative to the early killing period. With each increase in the half-life of DNA clearance, the differences between the rates in the early and late periods increased. In our replication cohort (19 South African patients), we also identified a biphasic pattern. With a clearance half-life of zero, the viable component decreased 92.1% (95% CI: 65.1–98.2%) by day 7. There was a significant change point at 17.3 days by which time the viable component had decreased 99.8% (95% CI: 93.8–100%). The number of observations was insufficient to fit models estimating the components of living bacilli and dead bacilli using half-life parameters. Our analysis identified a sharp decline in the burden of viable Mtb DNA during the first days of standard TB treatment. This finding is incompatible with the hypothesis that pre-treatment sputum is dominated by drug-tolerant phenotypes and that only a small proportion of Mtb is killed rapidly during initial TB treatment. Since the total Mtb burden is rapidly reduced, we conclude that the differentially culturable fraction could not have a clinically-significant degree of drug tolerance. Put simply, a rapid decrease in Mtb DNA in sputum must indicate rapid killing, regardless of whether the bacteria routinely or differentially culturable. Our analysis did not estimate what proportion of Mtb is differentially culturable. Rather we asked whether there is evidence in humans that differentially culturable Mtb is drug-tolerant to a degree that threatens the validity of the traditional culture-based biphasic paradigm of killing. The rapid clearance of total Mtb we observed suggests that the population of Mtb present at baseline could not be dominated by highly tolerant phenotypes. Our results do not imply that drug-tolerant phenotypes are absent from pre-treatment sputum. Instead, our analysis is consistent with the prevailing hypothesis that only a small fraction of Mtb in sputum is in a drug-tolerant phenotype at baseline. The rapid initial decline in DNA we observe is consistent with declines observed with other culture-independent measures of bacterial burden, namely messenger RNA (mRNA) and ribosomal RNA (rRNA). For example, both our previous study  and another  found that Mtb mRNA abundance in sputum decreases > 99% by the fourth day of treatment. Among South African patients, Honeyborne et al. described an 88% reduction in Mtb 16S rRNA during the first three days of treatment . Although slow-growing, drug-tolerant phenotypes likely have lower mRNA or rRNA content per viable bacillus than rapidly-killed phenotypes , the consistency of these changes in mRNA, rRNA and DNA with the changes observed in historical, culture-based studies reinforces the current finding that the differentially culturable fraction of sputum must not be highly drug-tolerant at baseline. Our analysis has several limitations. First, there is uncertainty around our assumption that 99% of DNA is from viable Mtb prior to treatment. In sensitivity analyses described in Additional file 2, we tested other assumptions (e.g., prior to treatment 80% or 90% of DNA is from viable Mtb); these assumptions had minimal impact on our conclusions. Second, the actual half-life of DNA clearance is unknown and may also vary from patient to patient. Our models therefore evaluated a spectrum of possible half-lives, ranging from zero days (i.e., instantaneous degradation) to 1.25 days. Since we observed an average decline of 1.56 log DNA by day 7, the hypothetical upper bound of average DNA clearance half-life is 1.4 day (calculated by assuming that all Mtb is dead at baseline). Our DNA clearance half-life assumptions are compatible with the observation that patients may remain sputum Xpert positive well after treatment completion since many DNA clearance half-lives pass before Xpert MTB/RIF turns negative . Finally, Xpert MTB/RIF CT values are not validated for quantification . We therefore confirmed Xpert MTB/RIF results by measuring DNA abundance and rate of decline in longitudinal specimens in a subset (n = 17) of these patients using a validated qRT-PCR assay . Models fit to qRT-PCR data recapitulated results based on Xpert MTB/RIF. Our study also had several strengths. First, our approach enabled us to make culture-independent estimates of change in viable Mtb during treatment. The advantage is that this analysis is agnostic to the question of differential versus routine culturability. Recent identification of differentially culturable Mtb [1–5] has provided insights into heterogeneous Mtb populations but the implications of differentially culturable Mtb for patients and treatment paradigms has remained unclear. Our analysis suggests that – in patients – differentially culturable Mtb are unlikely to be killed much more slowly than routinely culturable Mtb. Second, we evaluated these insights in a second and distinct study population from South Africa collected by a different group of investigators, which increases the generalizability of our findings. Finally, we used rigorous methods to maximize the accuracy of quantification and frequently repeated sputum collection. Our culture-independent analysis supports the traditional paradigm that TB treatment involves a short bactericidal phase in which most Mtb bacilli are rapidly killed followed a prolonged sterilizing phase in which minority subpopulations of drug-tolerant phenotypes are slowly eliminated. Our results are not consistent with the recently-proposed alternative hypothesis, namely that most of the Mtb population of sputum from treatment-naïve patients is tolerant of and refractory to antimicrobial treatment at baseline. Routine culture on agar plates may fail to enumerate a significant fraction of the bacterial population, but the differentially culturable Mtb population does not appear to be highly drug-tolerant. Our analysis corroborates the longstanding conceptual model of drug-dependent Mtb killing. Confirming the correct model of killing is critically important to the global community’ efforts to expand the pipeline of new drug regimens for Mtb. Nicholas D. Walter and Camille Moore contributed equally to this work. We wish to acknowledge the patients who participated in the study and the staff and administration of Mulago Hospital and the MU-UCSF Research Collaboration. This work was supported by National Institutes of Health [grant numbers K23AI080147 (to JLD), K24HL087713 (to LH), R01HL090335 (to LH),] Veteran’s Administration [CDA1IK2CX000914-01A1 (to NDW)] and Doris Duke Charitable Foundation Clinical Scientist Development Award 2017077 (to NDW). NDW, JLD, PN, CDA and GSS had the idea for the study. CM led the development of the model. WW, XAK, LH, CKE led enrollment and acquisition of clinical data. NDW drafted the manuscript. All authors commented on and approved the final manuscript. Institutional Review Boards at Makerere University, Mulago Hospital, the Uganda National Council for Science and Technology, the University of California San Francisco, and the University of Colorado Denver approved this study. All participants provided written informed consent.